Social media is shaking up public health and health care, including service delivery for senior citizens. The growth of the elderly population in the United States has put increasing pressure on all services for senior citizens. According to the United States Census Bureau, the population of Americans age 65 and over is projected to double to approximately 83.7 million people by 2050. Providing effective care to this vulnerable population is an urgent need. To address this challenge, social media platforms such as Facebook and Twitter can be used to improve or enhance professional networking and education, organizational promotion, patient care, patient education and public health programs. The management network for senior citizen health care is multi-sector and multi-disciplinary. In this network, social media provides stakeholders a unique opportunity to efficiently and effectively disseminate information on services. Facebook, Twitter and other platforms are useful mediums to directly share valuable health care information with those who need it most. First and most importantly, social media provides direct contact with the elderly. Senior citizens are surprisingly significant users of social media. By 2015, 35% of all those over age 65 reported using social media. Recognizing there may be less of an age restriction on social media consumption, health care stakeholders have a new method to reach an occasionally isolated constituency. With social media, patients can benefit through getting education, gaining information, networking, performing research, receiving support, setting goals and tracking personal progress. Dr. Kevin Campbell describes social media as an extension of the doctor-patient relationship. Additionally, social media can provide a louder voice to patients as advocates, and can help patients identify with others dealing with similar circumstances. 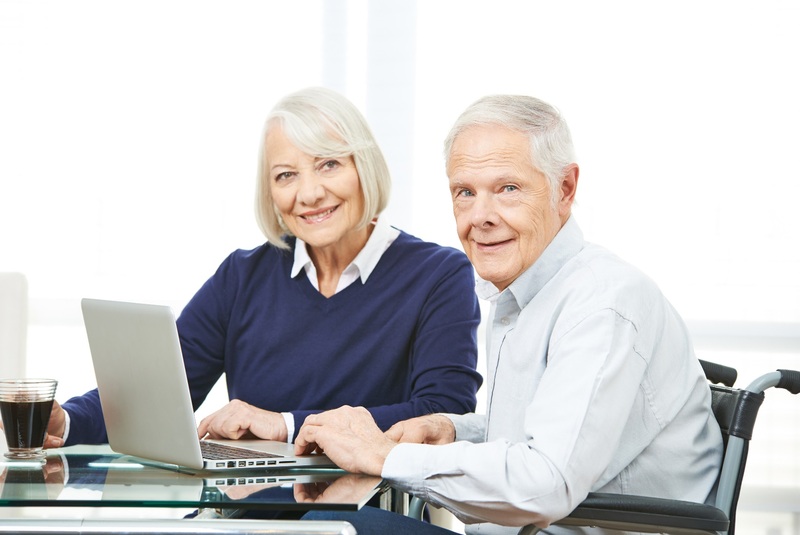 On a more personal level, social media allows seniors to connect with others and remain engaged with the world around them. Doctors and nurses are enhancing their communication with patients and the health care community by distributing information over Facebook and Twitter. Public health news, service alerts (i.e. event reminders, flu shots, etc. ), changes in policies and the benefits of taking care of yourself are all items shared by providers over social media. For example, Michael Lake of the American Public Health Association states Twitter is beneficial for amplifying public health messages. However, there are important precautions to using social media effectively and compliantly, including ensuring that professionalism, patient privacy and boundaries are maintained. The Center for Medicare & Medicaid Services, within the U.S. Department of Health and Human Services, warns nursing home staff about the regulations that prohibit the posting of unauthorized images of clients/residents to social media sites. A variety of public and non-profit organizations provide health care services to senior citizens. For example, the United States Department of Health and Human promotes services through the Twitter account and Facebook page for HealthCare.gov. Eldercare Locator, a public service of the U.S. Administration on Aging, utilizes their Facebook page to connect to and inform senior citizens and their families. Health-related charitable organizations are using social media to make a difference as well. For example, each year the Diabetes Hands Foundation sponsors the Big Blue Test. This initiative asks diabetics and their families to measure glucose levels before and after a period of exercise, and then enter their results into an app. Participants are then asked to share their experience on social media. Each test entry adds to a database of patient information, and triggers a $3.00 donation that is split evenly to three diabetes charities. Finally, social media connects with the network of family members and friends that care for senior citizens. Nearly 10 million adult children over the age of 50 care for their aging parents. Elder care can be very costly and complicated. Gathering all the necessary information, and making difficult decisions on health care is time consuming. Social media sites provide a mechanism to efficiently advertise services to a wider audience. For example, family and friends can also benefit from learning about breaking health care developments, and follow any updates from their elder relative’s medical providers. The health care of elderly Americans is a significant public issue. With the challenge to provide adequate health care for the rising population of senior citizens, social media provides stakeholders with an opportunity to share valuable information. Social media continues to be a gamechanger in service delivery by providing timely, accurate and relevant information. Author: Brian J. McLaughlin, MS, MPA is an adjunct faculty member with the Department of Public Administration at Villanova University, and has administrative experience with the judicial branch at the local, state, and federal levels. He can be reached at [email protected]va.edu.